Step up your pre-event promotion game! 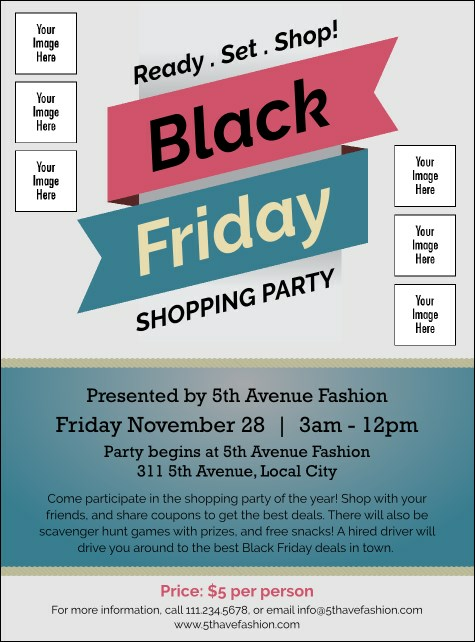 Order a stack of Black Friday Sale Image Flyers, printed especially for your fashion and beauty fete. This design’s gray, teal and red color scheme presents your event’s details in an appealing light. Highlight six participating brands and boutiques via its custom image upload spots! Take event marketing up a notch with TicketPrinting.com posters, flyers and more!